Well, it has been long since I went hunting for a nice brunch place so here I am! I chose this place because of high ratings from my sister and also because it is a rather new place for brunch. It is hidden in Raeburn Park (I really like the name of the park! ), just behind the old Tanjong Pagar Railway Station. The nearest mrt would be Outram, but I would advise you to check out the buses instead if you are not a fan of walking! To be honest, I was pleasantly surprised when we realized that the cafe was pretty much empty. For once, we did not have to squeeze with the Saturday-brunch-crowd. The place is beautifully decorated, in addition to the peaceful environment it is nested in. This makes a perfect place for you to hide out with a few friends or family over brunch. No worries about having to give up your seat. Portobello $23. Well, my friends and I were trying to fathom the significance of the name of the dish. Apparently, there was not much significance. Other than the surprising small portobellos which made us a little upset, I would say I enjoyed this. I also love the idea of Baked Sweet Potato with sour cream! However, we felt that this is not something exceptionally unique and different from other brunch cafes. Banana & Nutella Waffles $12. This is my favourite dish out of the 3! The whipped cream with pistachio nuts went really well with the bananas and waffles with nutella spread. It would be more fabulous if they could be a little more generous with their nutella spread. Foie Gras & Wild Mushroom $21. Well, I always felt that bennys were an essential part of brunch. Over at Parco, they have a few unique selections of bennys so we decided to place our stake on the Foie Gras Bennys which was recommended by the waiter. If you are a Foie Gras lover, this is the dish for you. For me, I still think the best bennys are the original bennys with poached eggs and ham. One more thing to share with you: There is a small gate that you can walk in from the Spottiswoode Park Estate. We were so happy to discover this little gate which led us to more discoveries along Everton Road and Duxton Hill. Several other places that you might want to try out around this area are Nylon Coffee Roasters, FLOR Pâtisserie and the Grim Affair! All in all, we felt that Parco serves pretty decent brunch and has a nice ambience. However, the location of the cafe would be a deterrence for me unless I am driving in! 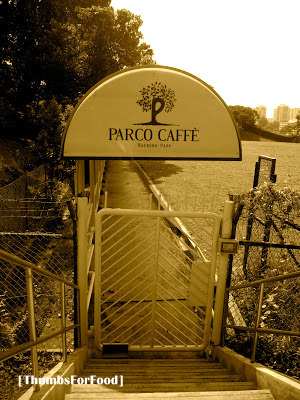 Lastly, there is free wifi at Parco for people who might want to tap on their wifi while at brunch.